On the left is a simple pulley. As the rope is pulled down the weight moves up by the same distance. In the compound pulley on the right the rope is wrapped around two pulleys. 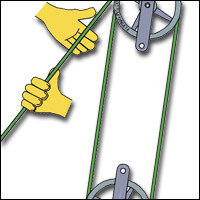 As the rope is pulled the weight, this time attached to the lower pulley rather than direct to the rope, moves up slower than the speed that the rope is pulled. Corresponding to this reduction in speed is an increase in the force on the weight. The amount of increase in the force depends on how many times the rope wraps round the pulleys. By wrapping the rope several times around the pulleys it is easily possible to lift your own weight off the ground! Belt drives are used transfer rotational motion from one place to another. On the left, both pulleys are the same size. Drive can be transfered by friction of the belt on the pulley or, if required, buy using a toothed belt. Chain drives work in a similar way. By crossing the belt the direction of drive can be changed. On the right two sizes of pulley are used to show how speed of rotation can be changed.